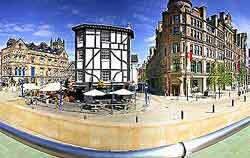 The tourist attractions in Manchester are certainly quite varied and when visitors first arrive, guided walking tours and open-top bus tours are strongly recommended, as are relaxing cruises along the River Irwell. Once you have gained your bearings of Manchester city, you will be able to check out attractions such as the striking Urbis building, the historic Boddingtons Brewery and the city's plentiful theatres. Manchester attractions also include an actual Concorde aircraft, which is open to members of the public and located at the city's airport. Tourists with time of their hands may like to consider a steam train ride along the nearby East Lancashire Railway, or perhaps a trip to the charming Fairfield Moravian Settlement. Manchester has an extensive programmed of walks around the city, led by qualified guides. These popular walks are both entertaining and informative, and you can join the walk with other visitors or arrange for a separate guided tour for your very own small group. The Manchester Tourist Information centres will be happy to arrange guided walks of the city..
Open-top hop on / off guided bus tours operate at regular intervals each day around the centre of Manchester. These bus tours provide an extremely popular way of sightseeing and allow you to depart at any given stop, explore at your leisure, and then catch the next passing bus. Since bus tickets are generally valid for 24 hours, consider purchasing them in the afternoon, so that you can also make use of these buses the following morning. Cruises around the Castlefield area provide a particularly scenic way to travel around this part of the city. With regular boat trips, including Sunday cruises with lunch provided, these boats come with interesting commentary and pass many leading places of interest and major buildings, offering views from a different angle. 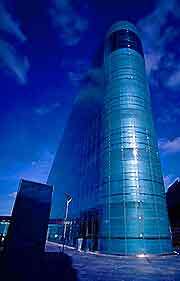 The Urbis, in the city centre, explores life in many different cities throughout the world and was amongst the first glass buildings to be built in Manchester. With exciting interactive exhibits, themed exhibitions, displays about contemporary culture and seasonal events, the Urbis also features a popular gift shop, the Conservatory Café and a highly regarded elevated restaurant. The Urbis is best known for its stunning, modern glass architecture and backs onto the Cathedral Gardens and the Corn Exchange. One of the few remaining Concordes, the most famous plane ever made, is now on permanent display at Manchester Airport, at the Aviation Viewing Park. Concorde was the world's first supersonic airliner and tourists and visitors to the airport are now able to take guided tours and view the aircraft - or even get married onboard this particular Concorde. Boddingtons Brewery Tours is located in the city centre and dates back almost 250 years. Attractions at the Boddingtons Brewery include regular guided tours, a gift shop and a popular public house. Bridgewater Hall ranks amongst the city's most easily recognisable buildings. This international concert venue is in main performance base for the renowned Halle Orchestra, the BBC Philharmonic and the Manchester Camerata. With a vast auditorium seating more than 2000 people, the stylish Bridgewater Hall is also home to many international concerts, jazz events, rhythm and blues music, local bands and solo performances. The East Lancashire Railway can be found in Bury, close to the city, and operates lovingly restored steam locomotives. With regular scenic train journeys to Rawtenstall, the East Lancashire Railway is a popular tourist attraction for the whole family. Hack Green Secret Nuclear Bunker is situated in Cheshire, to the south of Greater Manchester. This vast underground complex of rooms and tunnels is one of the most unusual tourist attractions in the area and features interesting audio-visuals about the history of this bunker. Located in Exchange Square, in the city centre itself, the Printworks Leisure Complex is an enormous entertainment centre, reputed to be the largest of its kind in the whole of Europe. With an enormous selection of trendy cafés, wine bars, restaurants, a large fitness centre and modern IMAX cinema, Printworks Leisure Complex is equally appealing to children, families and adults alike. The Fairfield Moravian Settlement is an impressive village area, in the Ashton-under-Lyne region of Manchester. With 18th-century buildings, a historic church and attractive surroundings, the charming Fairfield Moravian Settlement is located next to the Ashton Canal. The Runway Visitor Park allows spectators to view planes take off, whilst children can run around the play area. Restaurants, a picnic area and an aviation shop are also available, but the highlight of any trip would be to explore any of the park's onsite aircraft. The Barton Swing Aqueduct, in the Trafford Park area of Manchester, is part of the city's lengthy canal network, which dates back to Victorian times in the city. This impressive feat of engineering brought much wealth to the region during the industrial revolution and is now a scenic place for walking, cycling and travelling on narrow boats. The Manchester Velodrome is a spectacular indoor cycling track, with large seating areas for spectators. This Velodrome is actually the only Olympic cycling track of its kind in the United Kingdom.